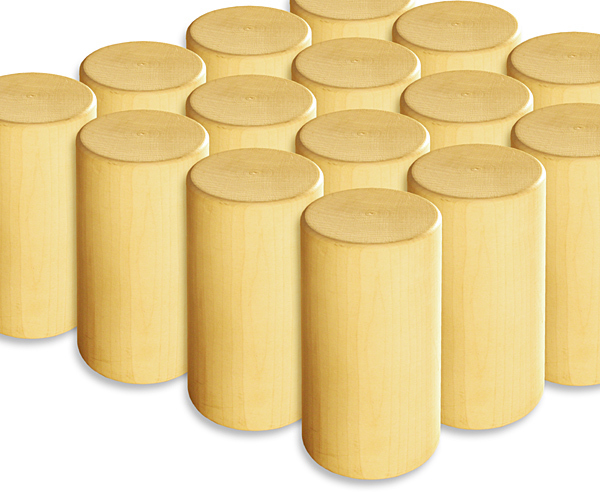 Bulk same shape set of 16 wooden block large cylinders. 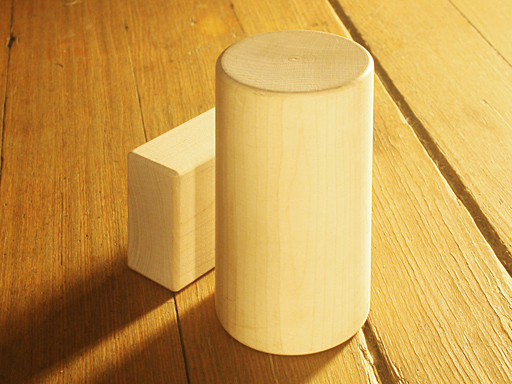 Each block in this set measures 5.5 inches long with a 2.75 inch diameter. This is based on the original and current standard unit block size and shape invented by Caroline Pratt and used in quality preschools and primary schools worldwide. Safe for ages 6 months and up. 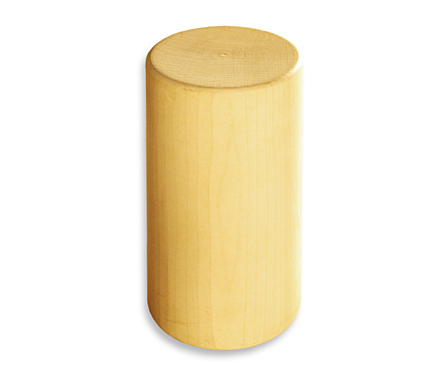 Completely free of borates, pesticides, and fungicides commonly added to rubberwood after harvest. We use only 100% Hard Rock Maple. Manufactured on demand in the United States from Custom Milled FSC®-Certified Hard Rock Maple when your order is received. Accurately cut to within half of 1/100 of an inch. 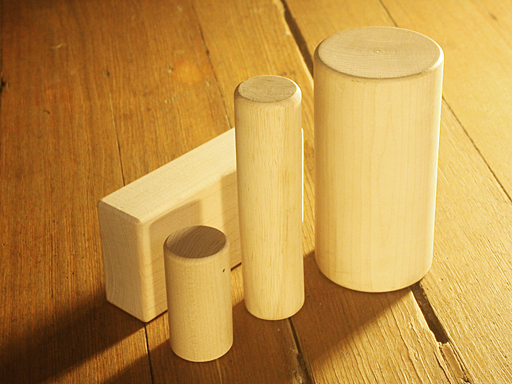 Compare with Community Playthings G513 Set of 4 Unit Block Large Cylinders, which is made from unspecified Soft Maple, NOT from Hard Maple. Includes the Continental United States, Alaska, Hawaii, Puerto Rico, U.S. Virgin Islands, American Samoa, Marshall Islands, Islands of Palau, and APO/ FPO addresses. Includes some of the nicest people you'll ever meet and the majority of our beautiful FSC®-certified Hard Rock Maple. Includes the European Union, Australia, New Zealand, Japan, China. USPS Priority Intl not available to Ascension, Bolivia, Falkland Islands, North Korea, Somalia. Because the costs of our raw materials, which make up about 1/3 of our retail price, are subject to change, we reserve the right to change our prices at any time and contact you to confirm permission to increase prices on orders not yet shipped. We will first make ever effort to reduce shipping costs to keep your total price the same. USPS Priority Mail and USPS Priority International Mail is typically the most economical way for us to ship our blocks with tracking because our smaller sets fit well in USPS flat rate shipping boxes. In some instances, we may change to another shipping provider to reduce costs, keep our prices reasonable, or improve tracking. Check Checks must be drawn on U.S. or Canadian banks in U.S. funds. We manufactured your order after funds are cleared and ship your order upon completion. Your order typically arrives 3-8 weeks from the date your payment is received. See our home page for current wait times. Boxes may ship as completed. Purchase Orders Purchase Order from School District, Museum, Government Agency, or other Institution. Purchases made by card receive priority attention. Please call us for more information. After the Purchase Order is verified, your order will be manufactured and will typically ship 6-12 weeks from the date you placed your order. See our home page for current wait times. Boxes may ship as completed. Money Order Money Orders or Postal Money Orders must be drawn on U.S. or Canadian banks in U.S. funds. We manufactured your order after funds are cleared and ship your order upon completion. Your order typically arrives 3-8 weeks from the date your payment is received. See our home page for current wait times. Boxes may ship as completed. Paypal Credit Card (Automatic Processing) for Visa, Discover, Mastercard, American Express, Bank Account, or Paypal through the Paypal payment gateway. We manufactured your order after funds are cleared and ship your order upon completion. Your order typically arrives 3-8 weeks from the date you placed your order. See our home page for current wait times. For December deliveries, please complete payment using this option by December 5th. Boxes may ship as completed. 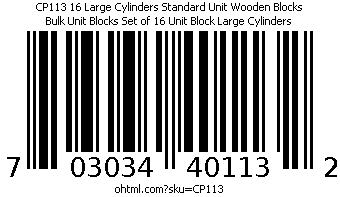 How to Order Standard Unit Blocks for Schools and Institutional Buyers. Although it’s safe and easy to pay online with Visa, Mastercard, Discover, American Express, or PayPal, we’re happy to accept Purchase Orders at any time for sets of Standard Unit Wooden Blocks from Schools, Museums, Government Agencies, and other Institutional Buyers. First, pick your blocks using the “Add to Cart” buttons just like a regular online order. Complete Your Order Online — If at all possible, save us all a lot of time by ordering what you want online and providing payment at the time your place your order. Orders placed online and paid for online are our preferred method for handling orders, and don't require any additional paperwork on our end. Please only go through the steps below if your organization is unable to make online purchases. Shipping and Billing Information — Fill in your “Shipping and Billing Information” and click the “Continue” button if you have not already done this. Payment — Select your “Shipping & handling” options, which include Free Shipping and other options. Then select “Purchase Order” as your payment method UNLESS YOU ARE ABLE TO PAY BY CARD and click the “Pay Now” button. Invoice — The next step will Thank You and show your Pro Forma Invoice. Please print this for your Accounts Payable person or, if you are the AP person, for your own records. You may also click “Bookmark Your Order ” for faster access later. Fax It — Your Pro Form Invoice should then be mailed or faxed back to us at our toll-free fax number, 888-516-0210, with the letterhead or purchase order customarily used by your organization. We will begin work on your order when your online purchase is confirmed via Purchase Order received via mail or fax. If you believe that you need additional forms, please contact us. Remember, when you create a Pro Forma Invoice, you are not ordering any blocks, and no blocks will be shipped, until we receive a Purchase Order confirmation (or, better still, payment). If you have questions, please call 828-419-0850 or 888-799-0797 Toll-free.